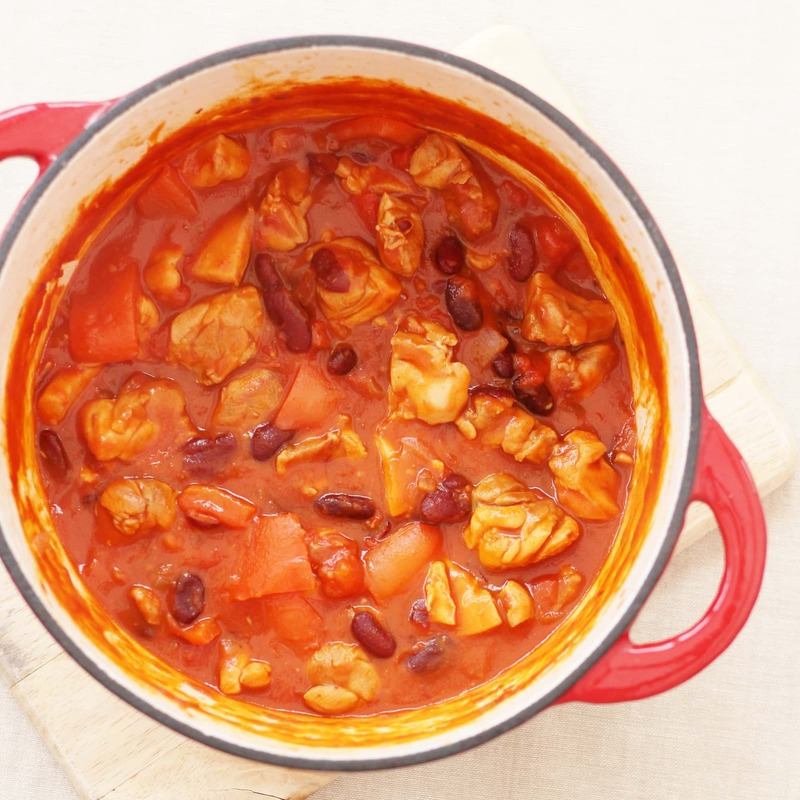 An easy peasy twist on a classic, this Chicken Chilli Con Carne is easy, healthy and totally delicious – plus it can be made in under 30 minutes – perfect for busy weeknights! 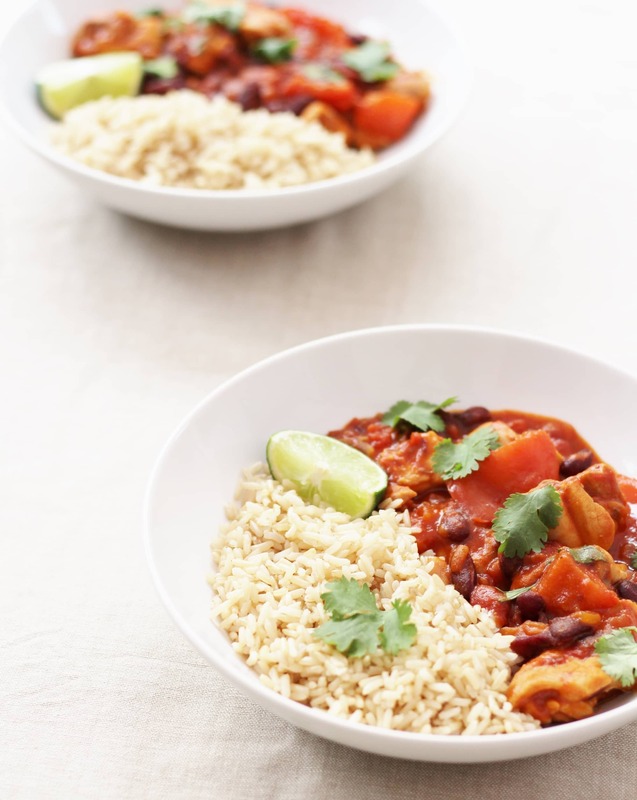 To say I have a chilli con carne obsession would be an understatement – I just love a good chilli – I love the flavours, it’s simple to make and can easily be made in double or even triple quantities to stash away in the freezer for future homemade ready meals. 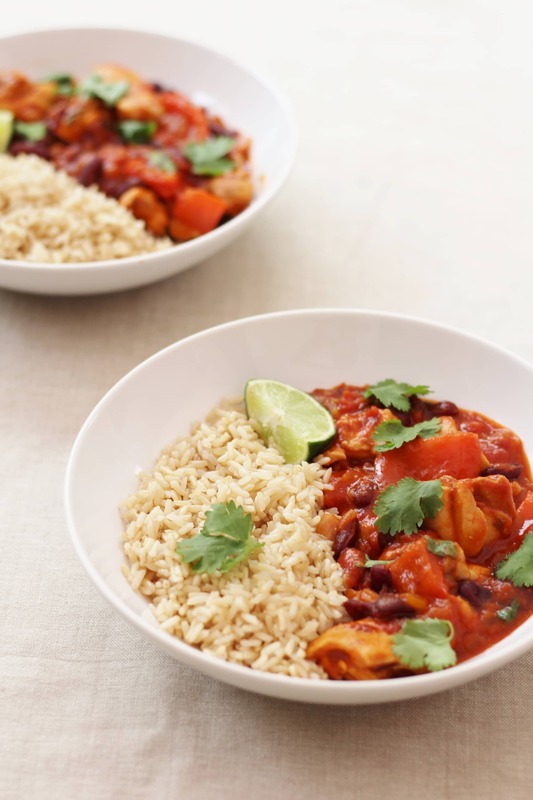 In fact, so far on this blog I have already shared 6 different versions of chilli – including my Quick Beany Chilli, my Sweet Potato Chilli and my absolute favourite, Slow Cooked Chilli Beef. But I am always looking for ways of reinventing this delicious classic. The thing about a beef chilli is, if you want to make it properly, it does take a while…and while most of that time is hands off time…well, there are often times when you just don’t have the time to let it simmer on the stove top or cook for hours in the oven. So anyway I decided to try my beloved (!) 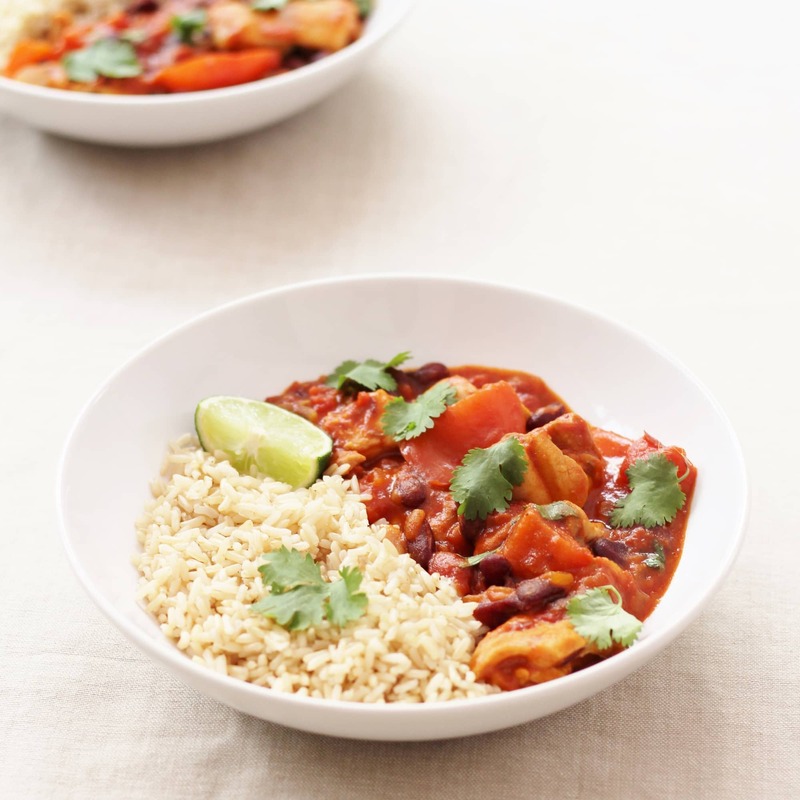 boneless, skinless chicken thighs in a chilli…and do you know what? 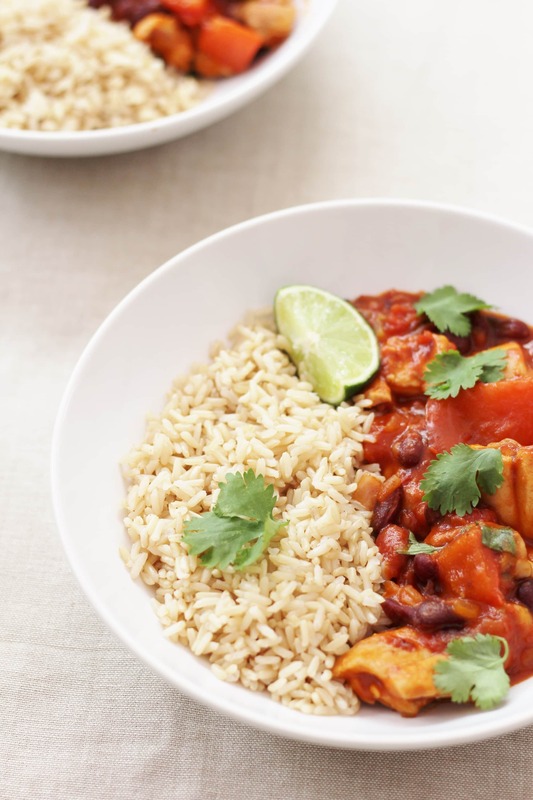 It worked a treat and makes a weeknight chilli con carne a doddle to rustle up…plus it’s fab if you are cooking for fussy children (or adults!) who don’t like beef, or you are trying to cut down on red meat. If chicken thighs are not your thing, then by all means use the same quantity of chicken breast fillets instead. Or you could easily make this veggie by using Quorn chicken pieces. If you are wanting to stretch this further, why not add an extra can of beans or a tin of sweetcorn? 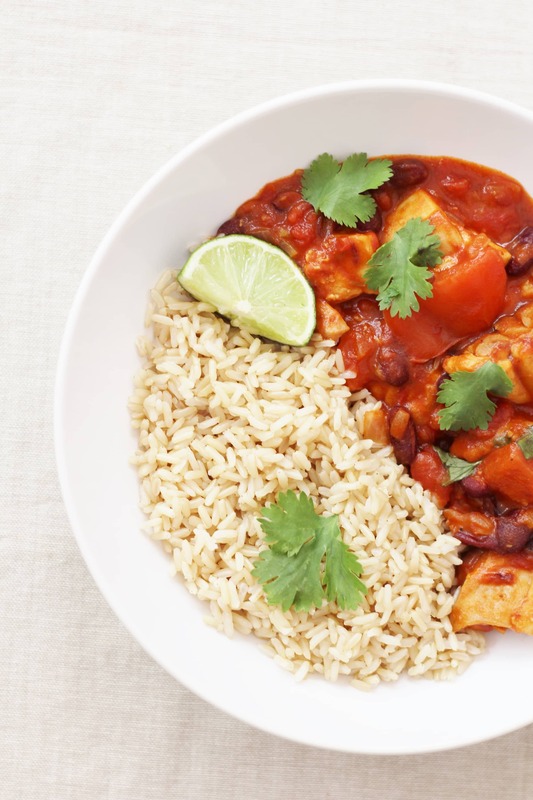 And if you want to make this even quicker and easier, swap the chilli flakes and other spices for a tablespoons or two of mild chilli powder instead. To make this meal more healthy, I served it with brown rice, but it would be good with white rice too, or in tortillas. And if you are making this at the weekend, or when you have more time, it would be great with all your favourite extras: guacamole, salsa, sour cream, tortilla chips…it’s easy to turn this kind of food into a feast! If you want a wine to go with this, I would pick a Chilean Sauvignon Blanc – pretty much anything will go with chicken, but Sauvignon Blanc does well with tomatoes and spice. If you prefer red, try a young fruity Argentinian Malbec or Chilean Merlot. Turn up the heat and add the diced chicken thigh meat and brown for 2-3 minutes, stirring frequently. Turn the heat back down and add the garlic, cumin, paprika and chilli flakes, stirring frequently. 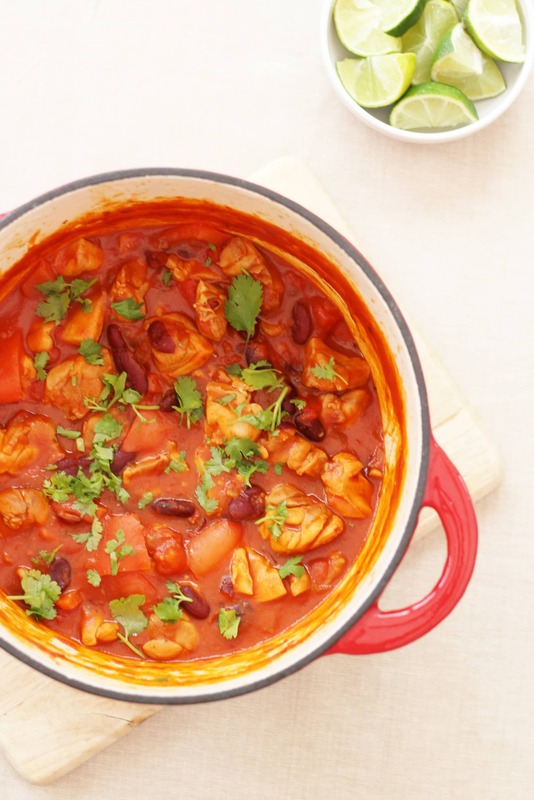 Add the red pepper, tomatoes and kidney beans, give everything a good stir and bring to the boil, then turn down to a gentle bubble for 15-20 minutes to cook the chicken and thicken the sauce. Stir occasionally. When the chilli is ready, stir in the chopped coriander and serve with the rice, lime quarters and extra coriander as garnish. I love a chilli feast – it’s just perfect with guacamole isn’t it. Sometimes we have it with chips and cheese for a naughty treat! Chilli is so versatile. Loving a chicken version and your photos are so bright and vibrant too! Little Miss GF made us chilli for tea the other week. I must share this recipe with her…… maybe she’ll fancy doing tea for us again! 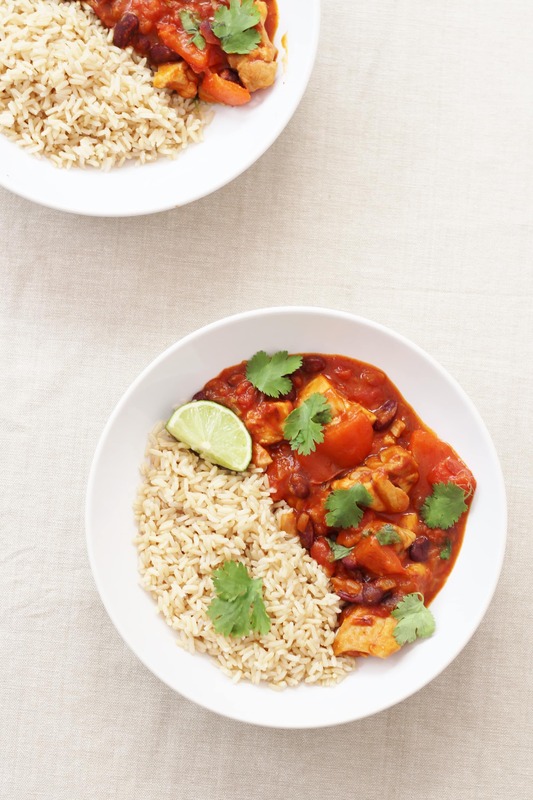 I would love this easy chicken chilli too Eb and I definitely agree with you about boneless skinless chicken thighs! They’re great for stews, chillies and curries and so much moister than chicken breast, although the rest of my family tend to like breast meat if I give them the option! Thank you so much for sharing with #CookOnceEatTwice. i have made a chicen chilli con carne before, but my OH complained that it wasn’t beef mince! Honestly that man does not like change! Yours looks very tasty Eb and has spurred me on to try a chicken one again soon. My feature at this week’s Sunday Fitness & Food link-up! What a beautiful dish! Congrats! 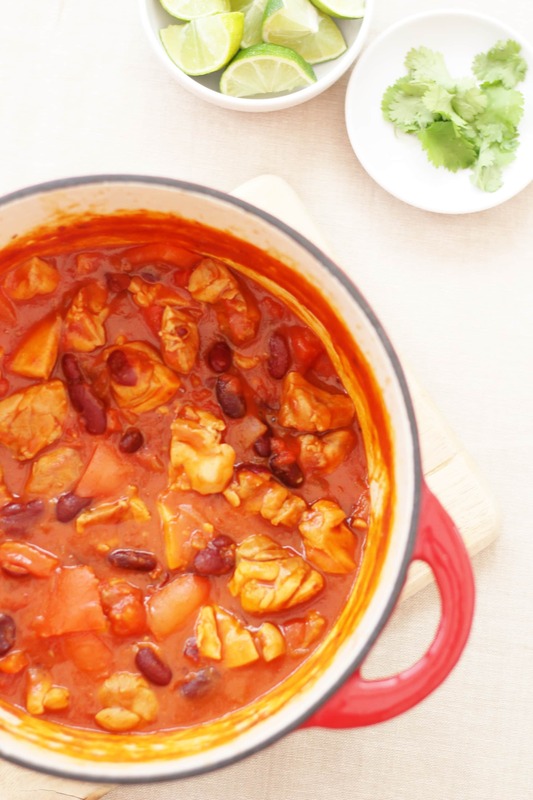 Oooh chicken chilli!! Yum! (Really should have eaten before I read this!!!) Agree with you about the skinless/boneless chicken thighs, they are my go to chicken pieces as they have more iron in than chicken breasts so they are better for the Peachicks! Plus I reckon they taste better too!! I am a great fan of smoked paprika and, with the other herbs and spices, the flavours seem nicely balanced. The only change I will be making is to use a fresh chilli rather than the flakes (I had a bumper crop this year, well over over 300 from 4 plants, with a couple of dozen Dorset Naga’s from another). Another I am considering is adding chocolate near the end of cooking time. It works very well in beef chilli, but do you think it would work in this recipe? After this evenings meal I now know why it is a popular recipe. I stuck to the recipe*, with the exceptions in my previous message and, not being sure of the chocolate, did half with and half without. My wife and I both agree the chocolate (1/2 square of dark) added another dimension to the very tasty ‘original’. *It was a ‘last minute’ decision to make this today, so as I did not have enough chicken thigh I added a well known makers vegetarian Chicken Style Pieces. I can’t say they added any flavour to the recipe, but they certainly did not detract from it. I will be passing this recipe, and your site details, on to family and friends. Our only dilemma now is chocolate or no chocolate!